The Pra Pratan Gleep Bua Hlang Yant Trinisinghae Muan Sarn Sacred Powders amulet, was released after Buddha Abhiseka Blessing Ceremony at Wat Pradoo Chimplee in the year 2521 BE, blessed by the Great Luang Phu To who presided over the Grand Blessing Ceremony. This edition recieved 3 months of immersion in Holy Prayer Water with blessings from Luang Phu To throughout the whole Trimester. This model is rare for being in the much rarer Pong Gesorn Gae ANam Man oily pollens sacred clay. The amulet was released in two ‘Pim’ (versions); Pim Yai (large, 22,875 amulets made), and Pim Lek (small, 20,805 amulets made). This amulet is in perfect condition, without any flaws or wear and tear, making it very eligible for show in competition. This amulet is considered to be one of the more easily reachable (affordable) amulets of the Pantheon of Famous Classics, and is very popular amulet with middle and upper middle-class devotees of Luang Phu To, who seek an authentically blessed amulet of esteem and respectable value from this master, but that won’t necessarily cost them the deeds to their house to be able to afford. 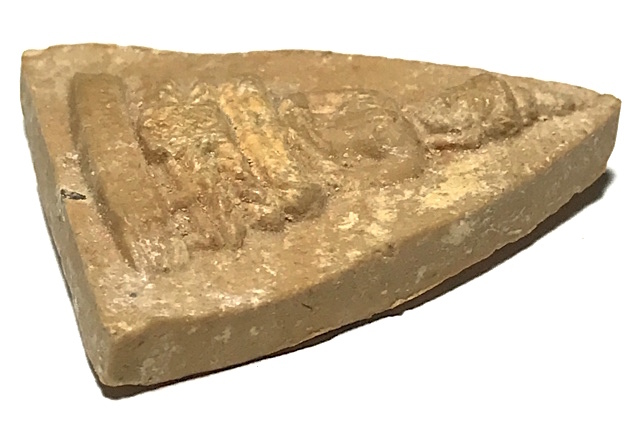 The Sacred Yant Trinisinghae is Embossed on the rear face of the Amulet for Metta Mahaniyom and Maha Lap Blessings. 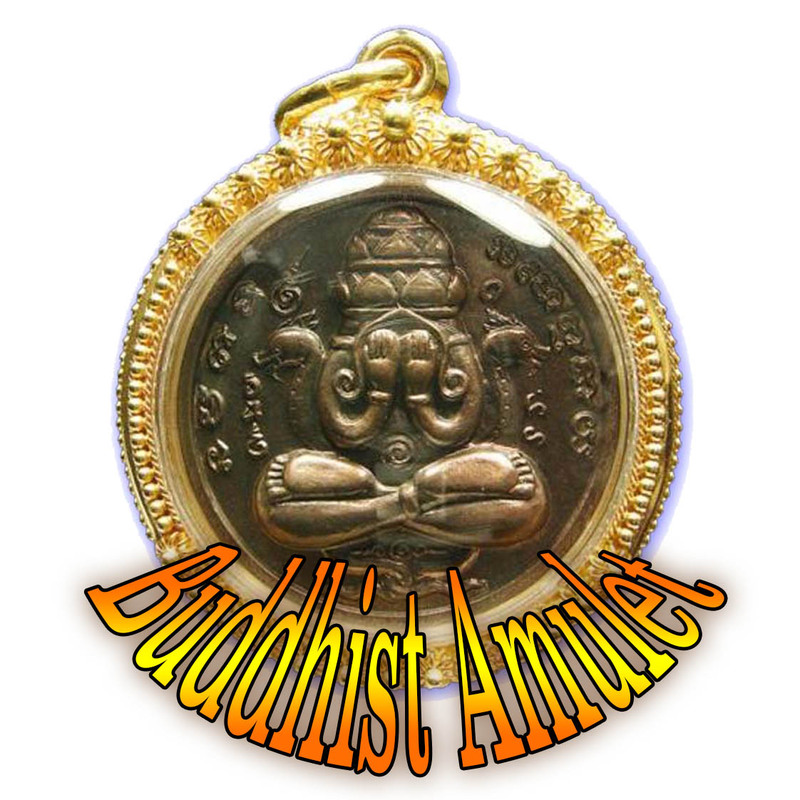 The amulet is a Pim Yai large version measuring 3.5 x 2.5 Cm,, and is in pristine condition. The Muan Sarn Sacred Powders are made from Puttakun Yantra Powders of Luang Phu To, with Gesorn Pollens and Incenses. The powerful magic and spellcasting abilities of Luang Phu To are of course one of the major influential factors as to why his amulets have become such priceless Masterpieces, and his special Muan Sarn Sacred Powders are another highly influential aspect of their popularity and fame. The Yant Trinisinghae was often inscribed on Yantra foils for devotees who would bring a foil with them and Luang Phu would inscribe it. The devotees would then take the foil home for Bucha, or roll it into a Takrut to wear as an amulet. 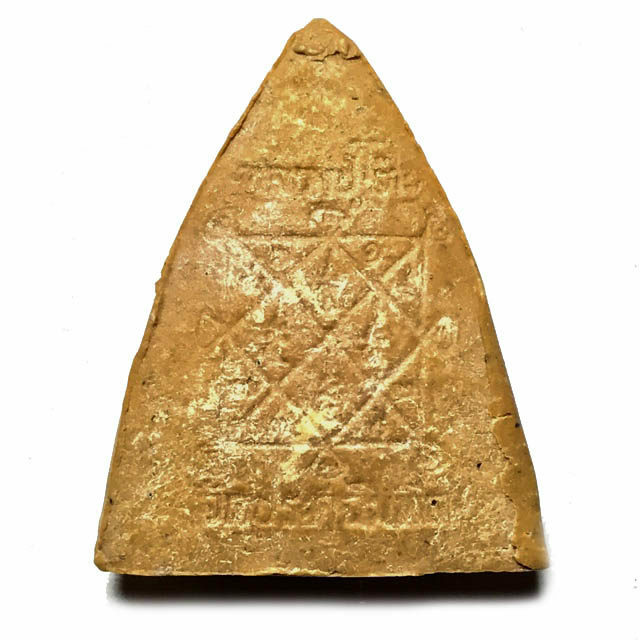 This Yantra was first used on the rear face of an official amulet edition, with the first edition Rian Run Raek Guru Monk Coins. The Yant Trinisinghae is not only powerful for Maha Lap and Serm Duang (improve fate and destiny), but also for being highly effective against Black Magick, Ghosts and Demons. 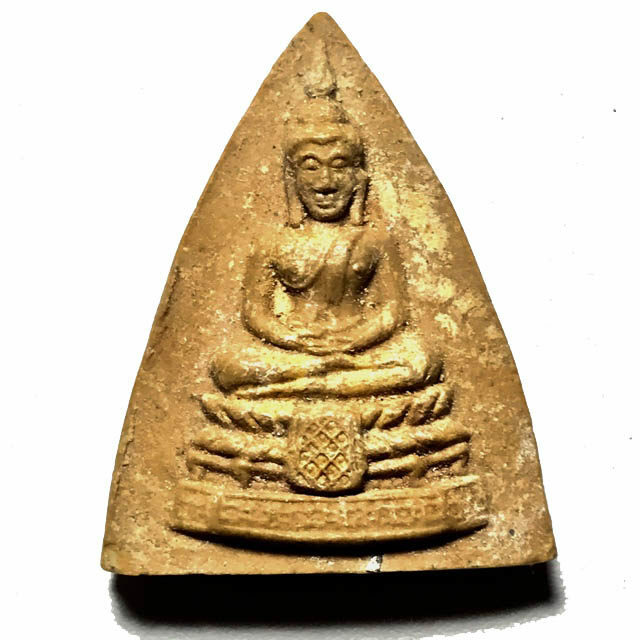 This resulted in Luang Phu always choosing the best most powerful Masters to invite to attend his empowerment ceremonies to assist in the Blessing of amulets and Buddha Images. Luang Phu To remains to this day one of the top 10 Guru Masters in the recorded History of Thai Buddhist Amulet making, and most certainly one of the top 5 Monks of recent History, on an equal Par with the Great Luang Phu Tim (Wat Laharn Rai).His amulets belong to the Master-Class status category, and carry immense status in the world of the amulet appreciation society, for their Authentic Sacred Power, and the Purity of the Monk who Blessed them. The amulets of Luang Phu To are famed and revered by devotees around the country and around the whole world, for the proven history of Metta Mahaniyom Maha Lap Klaew Klaad Kaa Khaay power to bless the devotee with lucky fortunes, safety, success and prosperity. 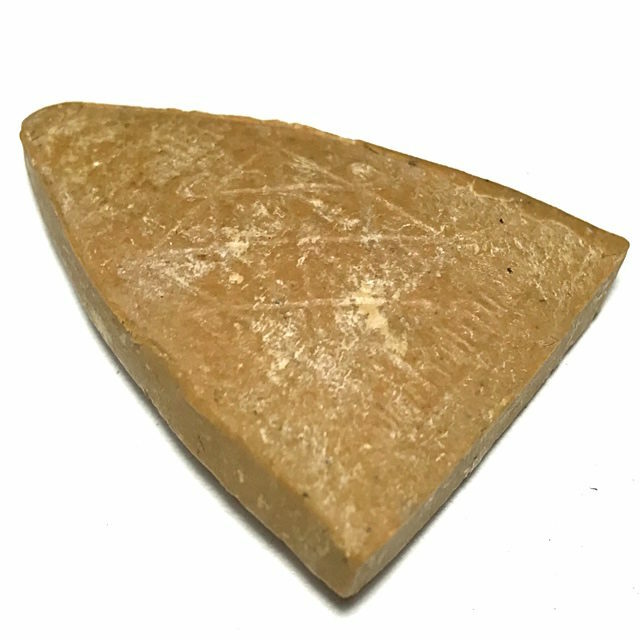 Luang Phu To began to make Muan Sarn Sacred Powders amulets first in the year 2470 BE, using the main ingredient of Pong Lob, which is the residue chalks fallen from the inscription of five rounds of 108 Sacred yantra spells, to create five different concentrates of Sacred Powders. These five powders are of course known as; Pong Bpathamang, Pong Ittijae, Pong Puttakun, Pong Trinisinghae, and Pong Maharach. 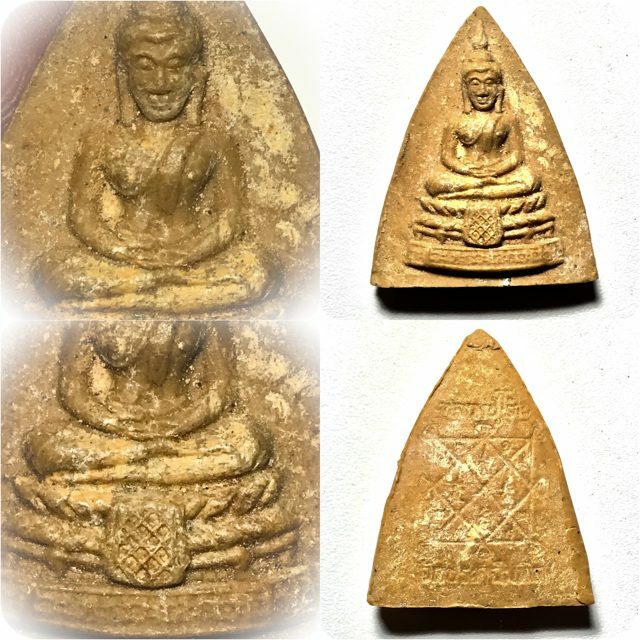 It is also known that Luang Phu To would use broken up amulets from Wat Plab, and also broken up pieces of Pra Somdej Wat Rakang Kositaram of the great Somdej Pra Puttajarn (Dto) Prohmrangsri, are known to be present within the Muan Sarn Sacred Powders of Luang Phu To’s amulets. Other Muan Sarn used for the amulets include Pong Puttakun from Por Tan Klai (Wat Hongs, Thonburi), and of course Luang Phu To would bless the amulets in Nam Montr Prayer Water, using a Clay Holy Water bowl in his Kuti Hut, with a Dragon design on the bowl. 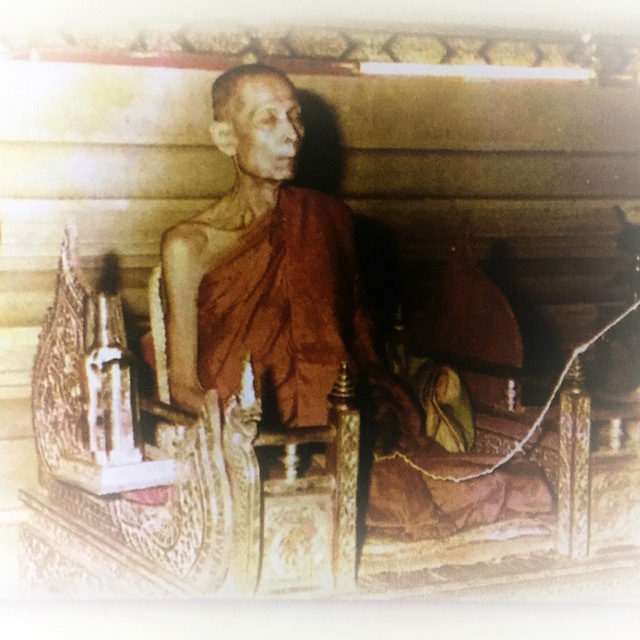 He would immerse the amulets in the holy water bowl, and When devotees would donate flowers to Luang Phu, he float the flowers in the prayer water bowl and use the offering to empower the amulets further. This in fact, is one of the reasons that some amulets have different holy water stains on their surfaces than others, due to the different flowers Luang Phu would immerse in the holy water bowl where the amulets were soaking. Luang Phu would empower the amulets for the time of the Rainy season retreat (3 months), and repeatedly empower and bless them throughout this time. Some amulets were also released without immersion in prayer water. Of the 28,875 Pim Yai amulets made, 10,000 of them were donated to Princess Julaporn, to distribute as a gift to the people who made merits donating to build the Sirirat Hospital. The Pra Pratan Gleep Bua Pim Yai and Pim Lek amulets are very popular with Devotees, for they are made from precisely the same Muan Sarn Sacred Powders as was used for the Pra Pid Ta Jumbo 2 Traimas Masterclass edition, which can cost up to even 40 times the price of a Pra Pratan Gleep Bua. 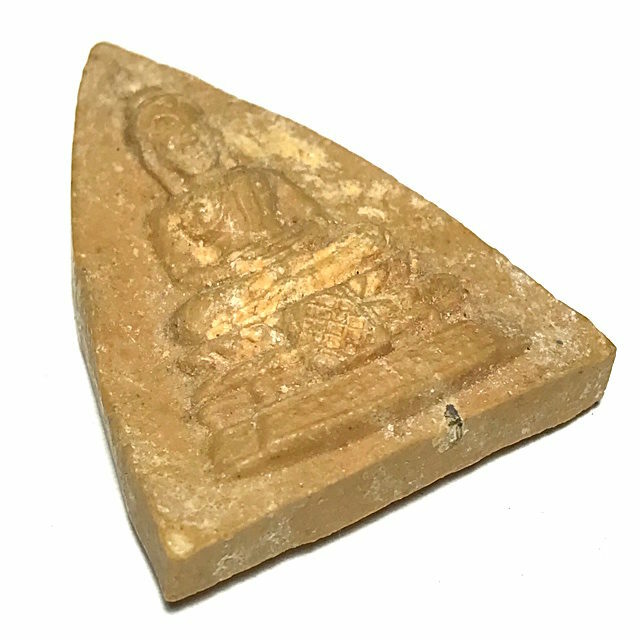 It is hence obvious why this amulet is such a popular amulet with the devotee of Luang Phu This Votive Tablet is an Absolute Rarity and Eternal Classic, and extremely sought after spiritual item.The perfect choice for aesthetic beauty, spiritual value, and magic power, and top choice for the Serious Collector. This beautiful amulet is most definitely a very fine acquisition, as a Sacred Votive Tablet of Pra Niyom Preferred Classic Category, that has been well looked after and maintained in its original state, and is a very well-kept amulet, that is worthy of competition entry for its clear features. Luang Phu To was born on the 27th March 2429 BE in Ban Klong Bang Noi in Samut Prakarn and passed away on 5th March 2524 BE. His many honourable awards of status reflect his great practice and diligence.